KABUL, Afghanistan "Listen to my story! Listen to my pain and suffering!" 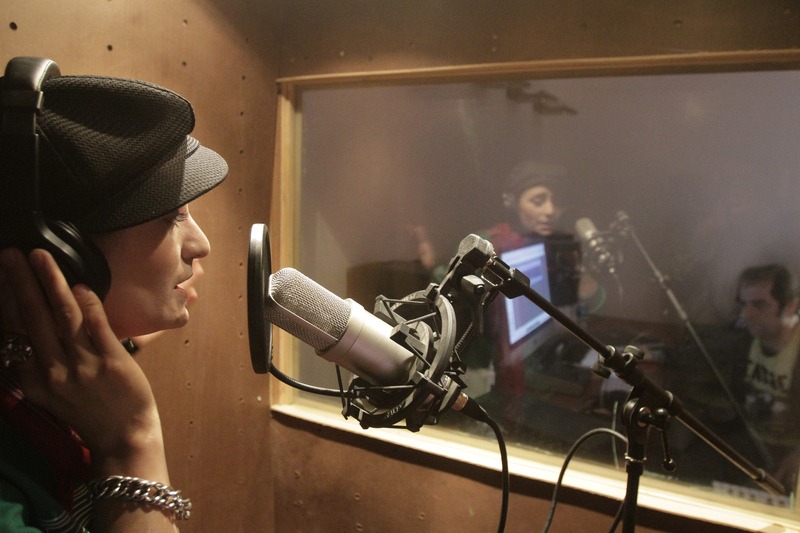 Afghanistan's first female rapper Sosan Firooz pleads into her microphone. She sings about repression of women, her hopes for a peaceful Afghanistan and the misery she says she experienced as a small child living in neighboring Iran. Her family fled there during the Afghan civil war of the 1990s and the hardline Taliban regime's rise to power in 1996. During her five-year stay there, she said the Iranians looked with disdain on Afghan refugees. "I remember while we were in Iran, we were called 'dirty Afghans' and told to go to the back of the line at the bakery," Firooz, who also spent time as a refugee in Pakistan and returned to Afghanistan with her family seven years ago, told The Associated Press in an interview. Her song's message to Afghans: Stay in your homeland. Those who leave, she sings, will only get jobs washing dishes or working at a car wash. "They will miss their homeland," she raps in a staccato style, part rap and part hip-hop. "They will want to kiss the dust of their homeland." "What is the result of Afghans being refugees in Iran and Pakistan?" she raps in Dari, one of Afghanistan's two main languages. "Half of them are addicts and the other half are terrorists!" So far, the song, titled "Our Neighbors," has only been released on YouTube, with a video that shows a series of pictures of Firooz posing in a hip-hop style gear, with jeans, dangling chains and bracelets. In some pictures, she wears a bandana with skulls, but her long hair flows freely, with no headscarf -- a rarity among Afghan women, including the few female singers. She is still not yet widely known among Afghans, but she's breaking traditional rules for women in a very conservative society, where some women don't go outside without wearing blue burqas that cover them from head to toe. Violence against women is still common in Afghanistan, especially in remote areas. There are reports of women being stoned or executed in public for having affairs with men. Women are arrested and others set themselves on fire to escape domestic violence. Women accused of adultery have been killed or imprisoned. Firooz's uncle has cut off relations with his family because she appears on TV and sings, says her father, Abdul Ghafar Firooz. He says he has quit his job at the government-run electric department to accompany her whenever she leaves the house and protect her as she pursues her acting and musical career. "I am her secretary, answering her phones. I am her bodyguard, protecting her. When she's out, I must be with her," her father said. "Every parent must support their daughters and sons to help them progress," he said. Her mother, who does humanitarian work in some conservative, remote areas of southern Afghanistan, says she's careful not to mention her daughter's budding career. Rap and hip-hop are just starting to gain popularity in Afghanistan, particularly among the youth. There are a few male rappers, including 28-year-old Bejan Zafarmal -- nicknamed D.J. Besho -- who have made a few CDs that can be bought in the Kabul bazaar. Firooz's first -- and so far only -- song was arranged by well-known Afghan singer and composer Fared Rastagar, who recently returned from living in Germany and has a recording studio in Kabul. She lives with her family in a mud brick house in a poor neighborhood in north Kabul. She uses an old desktop computer to write her music, but sometimes it doesn't work. She received an electronic keyboard as a gift from one of her supporters. She doesn't have the money to make CDs or a more elaborate music video.